This surprisingly bright planetary nebula is located just 2½° north of Albireo, but few people have ever seen it. The Herschels missed it, and it is nowhere to be found among the entries in the New General Catalog. American astronomer William Wallace Campbell spotted this unusual star-like object through a visual spectroscope at Lick Observatory in 1893. He could tell immediately from its spectrum that, despite its stellar appearance, he was not seeing an ordinary star at all. Instead, he had spotted an uncharted planetary nebula. 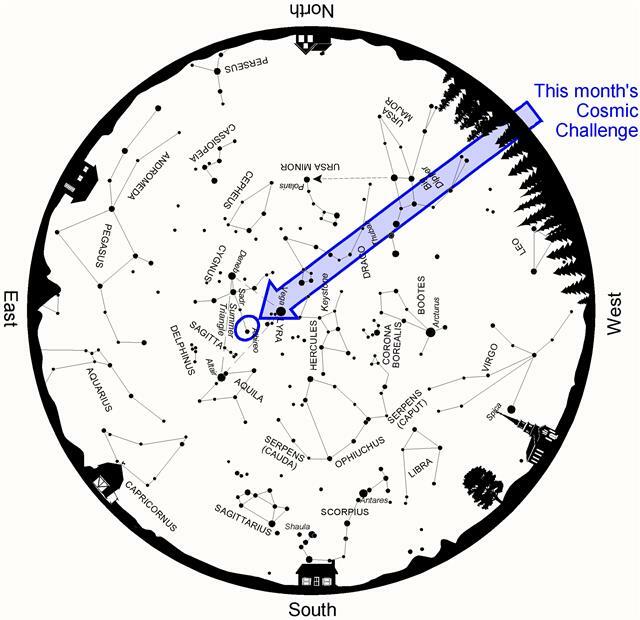 Above: Summer star map showing the location of this month's Cosmic Challenge. 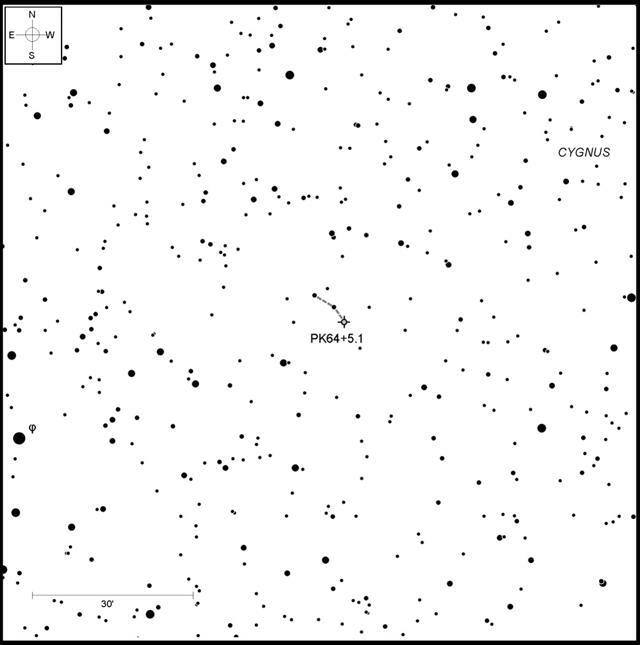 Although we know this little-observed target best by its nickname, Campbell's Hydrogen Star, it is more often labeled on charts as either PK64+5.1 or Henize 2-438. The former is its designation in the Catalog of Galactic Planetary Nebulae (Perek, Kohoutek; Acad. Publ. House of the Czech Acad. Sci., pp. 1 - 276, 1967), while the latter is from Karl Henize's paper "Observations of Southern Planetary Nebulae" that appeared in the Astrophysical Journal Supplement (vol. 14, p.125, 1967). The star in the center of Campbell's Hydrogen Star is catalogued as HD 184738, a rare WC star. These stars are a variant of Wolf-Rayet stars. Wolf-Rayet stars are hot, massive stars rapidly discharging material and losing mass. The spectra of Wolf-Rayet stars show broad emission lines of helium, nitrogen, carbon, silicon, and oxygen, but with hydrogen lines usually weak or absent. Wolf-Rayet stars are subdivided according to their spectra's principal emission lines. Massive WN stars are dominated by ionized nitrogen, while lower mass WC stars like HD 184738 are characterized by carbon. Finally, the spectra of WO stars are oxygen-dominant. Campbell's Star is 2½° north of my favorite double star, Albireo [Beta (β) Cygni], but to find it, I usually prefer to cast off from Phi (φ) Cygni, a little ways northeast along the Swan's neck. Heading 1° due west and 1/3° due north of Phi puts you in the right place. There, look for a diagonal line of three equally spaced 10th-magnitude stars. The planetary nebula is the line's southwestern "star." Part of the challenge in identifying Campbell's Star is that the nebula's 10th-magnitude central star completely overpowers the tiny, 7.5 arc-second disk at low and medium powers. It's visible in my 16x70 binoculars as one of myriad faint stars in an overflowing field of stardust. 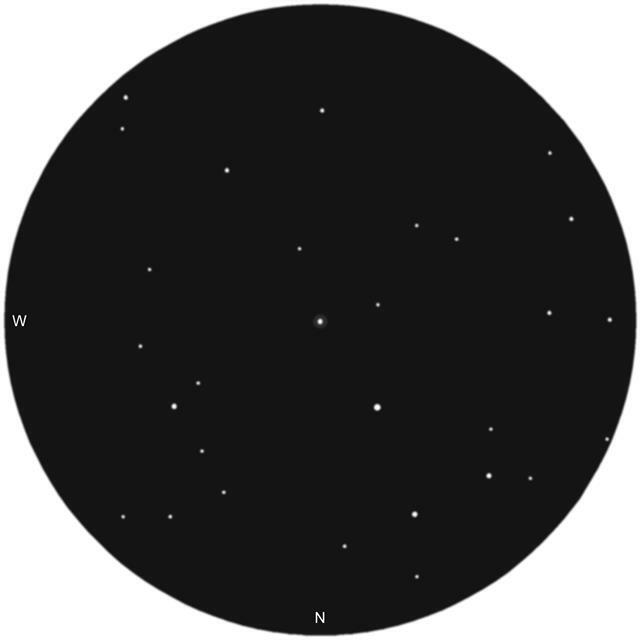 It takes 200x in my 4-inch refractor to show the nebula's subtle glow, as shown in the sketch below, but only after studying it intently with averted vision. Little benefit is realized by "blinking" the nebula with either a narrowband or an oxygen-III nebula filter, although there is some modest improvement using a hydrogen-beta filter. If you happen to have one, be sure to give it a try. Above: Campbell's Hydrogen Star as sketched through the author's 4-inch (10.2cm) refractor. 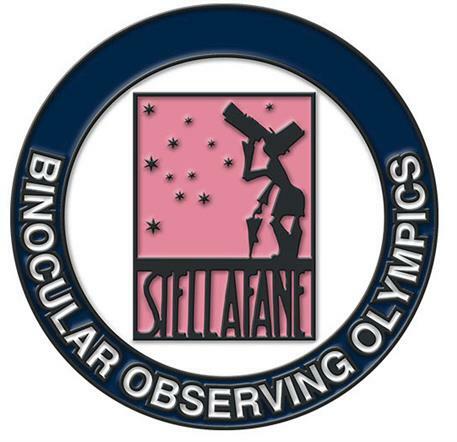 For those heading to Stellafane this month, Campbell's Star is one of 20 objects listed on my BOO list, Stellafane's first Binocular Observing Olympics, a companion to the convention's popular Hidden Gems Observing Olympics. The BOO list, including finder charts, can be downloaded from the Stellafane web site. Anyone who sees 15 of the 20 objects on the list while attending the convention is eligible for a commemorative pin showing the "Little Bino-Man," my adaptation of Stellafane's iconic Little Man. See the web site for rules. If you'll be attending, I hope you'll stop by my talk, Harrington on Binoculars, at the Flanders Pavilion on Saturday, August 11, at 11 AM. Hope to see you there! I was unsuccessful the first few times I tried to find it. Too many stars. Over the years I made it my mission to locate Campbell’s as well as nearby Minkowski 1-92. I agree with your sketch. I can find it with a 4” at low power. At high power in my 18” it’s a thin orange concentric ring close to the central star. Definitely a tiny disk compared to other field stars. Campbell’s is incredibly bright in Hydrogen-Alpha. To me it has the highest surface brightness of any H-a emitting object. 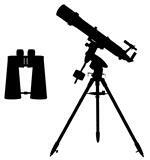 I very recently observed both Campbell's Hydrogen Star and Minkowski 1-92 with my 63mm Zeiss Telemator. I've observed them both before, both in the Telemator and much larger instruments. Of these two, Minkowski 1-92 is by far the easier to see in a small scope, but in a larger one (with excellent optics) CHS is more impressive. In a C8 at 800x, it's a lovely, pale orange disk. A very unusual color for a planetary nebula. I observed the nebula 3 years ago in 82mm refractor. At around 300x, it started being non-stellar. At 630x, I was able to observe the hints of the ring and some brightenings. I have seen this PN with my 8" dob and 4" refractor. Needs high power and good seeing. S&T column Deep Sky Wonders when he wrote about it. in the second half of the 19th century. The bright red color is amazingly apparent, it makes this planetary nebula stick out like a sore thumb. I was at Stellafane this year and got skunked on this one. I'll have to give it a try when the weather clears. I really enjoyed the Bino list. Thanks. Glad you liked the list, but sorry you missed this little guy. Probably the toughest on the list! Did you manage to catch all of the others? Just curious, what size binoculars were you using? 20. Stock 2 Muscleman Cluster. Probably saw, since I looked at the double cluster it but didn't recognize it. I was just not familiar enough with those objects. I'm going to try finding #13 at the Acadia Night Sky Festival in two weeks.